The 2000s, also known as the naughties was the decade that started on January 1, 2000, and ended on December 31, 2009. November 7, 2000 – George W. Bush is elected President of the United States. The results were not known until December 12, 2000 due to the state of Florida being too close to the results. January 13, 2001 – A 6.6 magnitude earthquake strikes El Salvador killing at least 400 people. February 20, 2001 – An outbreak of foot-and-mouth disease occurs in the United Kingdom and over 10 million sheep and cattle were killed. July 2, 2001 – The first artificial heart is implanted in a human being. 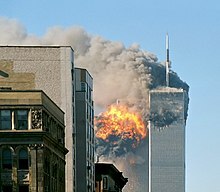 September 11, 2001 – Terrorist attacks are carried out on the World Trade Center in New York City and The Pentagon in Washington, D.C. by members of the Islamic extremist group Al Qaeda. The attacks involve the hijacking of four American passenger planes. Almost 3,000 people die. Two of these planes fly directly into the two towers of the World Trade Center, causing both towers to collapse. A third plane flies into a section of the Pentagon. A fourth plane crashes in a field in Pennsylvania after the terrorists are overpowered by passengers. September 18, 2001 – Letters containing anthrax spores are mailed to several American media offices and two American senators. Twenty-two people are exposed and 5 people die. September 21, 2001 – A chemical factory explodes in Toulouse, France, killing 29 people and seriously wounding over 2,500. 2001 – War in Afghanistan (2001–present) begins as the United States, with help from other countries, invades Afghanistan. 2005 – 2005 Atlantic hurricane season is the worst on record. 2006 – January 16: Ellen Johnson Sirleaf, in Liberia becomes the first female president on the African continent. 2006 – December 30: Saddam Hussein is executed in Iraq. 2007 – May 16: Nicolas Sarkozy becomes President of France. 2007 – June 27: Gordon Brown becomes Prime Minister of the United Kingdom. 2008 – February 24: Cuban President Fidel Castro retires. He is succeeded by his brother Raul Castro. 2008 – May 3: Burma is hit by Cyclone Nargis. 2008 – May 12: China's Sichuan province is hit by a major earthquake. 2009 – January 20: Barack Obama becomes the 44th President of the United States and the first African-American President. 2009 – June 12:The end of analog television broadcast all across United States switch off analog transmitter and translation to Digital Television. This page was last changed on 25 March 2019, at 00:47.